The Onyx series from Alvin is a Functional fold-away table with many quality features at a budget price. 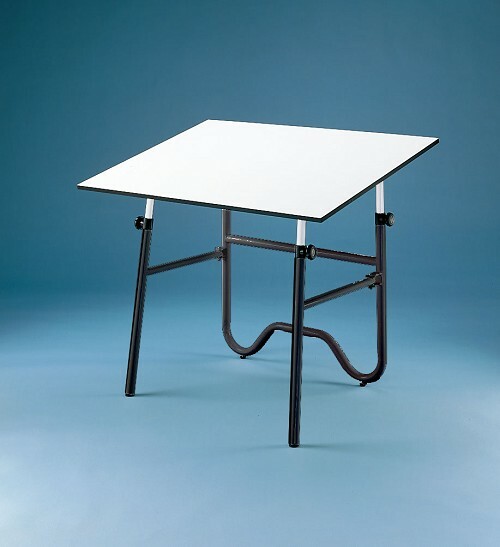 It is one of the most popular drafting tables from Alvin at an entry level point and is well suited for those looking for convenient storage and ease of traveling. The Onyx draft table is offered in two different sizes. The 30" x 42" is the larger of the two. • Table top itself adjusts from 0° to 45°. • Solid, contemporary style base has complete flexibility and sets up in minutes. • Fold-away gate hinge permits foot base legs to fold flat to 5" (including board top) in seconds for convenient storage and ease of transportation. • There are 2 top sizes available with white Melamine® laminated warp-free drawing surface. 146 points will be rewarded when you are logged in to your account and buy this item.